Well, she didn't tank as expected. Fortunately for her, her expectations were set very low. I'd have to say that I prefer Palin's approach of not attacking the other side. 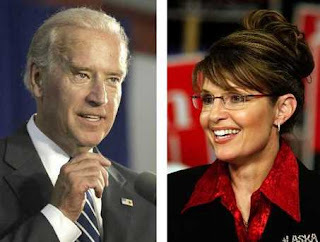 I saw a stat where she only said Obama's name 16 times, whereas Biden said McCain's name 42 times. I would really prefer that all the candidates tell us what they are going to do, not what their opponent is going to do. Palin is probably well versed at this since we always drill into our children not to put others down to build yourself up. Palin did slip into her rambling a few times where she just didn't make sense. But she always recovered with some sort of energy comment. I think she must have mentioned energy at least 42 times! But, hey, go with what you know, right? I much preferred Biden's speaking style. He actually showed emotion, whether it be annoyance or laughter. He was emphatic on some points and very clear where he stood. He did not dance around points. He would give a clear answer and then repeat it. It is not often where a politician will give such clear answers and I liked that. Even if I didn't agree with all his opinions, I have a huge respect for someone willing to tell us their opinion. He also admitted at the end that he has had to change his stand on issues for the better of the people. I am willing to bet that every politician in our country has had to cave on some issue in their career for one reason or another. I find it hard to believe when Palin said that she has never had to (aside from budgets). I think Biden proved to be honest, charismatic, funny, committed and a fairly well versed on the issues. I believe that Palin was evasive, stiff and just had a lack of general knowledge that extends beyond energy.